Instructors may want to move the student reading in Step 1 "All About Glaciers" and make it a reference for students for their research on the Internet, Step 4. Create worksheets or scaffolded guides for students to help them conduct more targeted research. Consider having students work in groups during the Internet research component. Provide age-appropriate Internet sites for research (Step 4). Distribute the rubric for the presentations to students ahead of time. This activity is an opportunity to discuss the process of science and how to vet for quality of research and information. Other supplemental activities to aid student understanding of glacial processes include the PhET Glaciers Interactive http://phet.colorado.edu/en/simulation/glaciers] and the ANDRILL collection of hands-on experiences [http://www.andrill.org/flexhibit/flexhibit/materials/activities/index.html. Students investigate how scientists monitor changes in Earth's glaciers, ice caps, and ice sheets. The teaching sequence, from eliciting student background knowledge to the final presentation, effectively builds student knowledge about glaciers and how scientists study their changes. Additional structure may help guide students in doing research (Step 4). 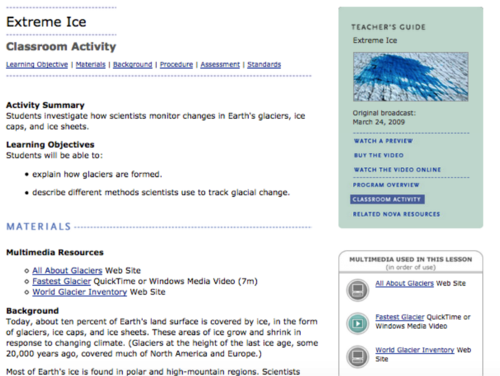 Building student knowledge about glaciers using related CLEAN selected activities prior to doing this activity would help set the stage, particularly their glacier research. If Internet access is not available for all students, the initial readings can be printed and distributed. Some of the links are broken within the activity, yet those sites still exist at the links below.